The Koren Specific Technique (KST) is a fairly new approach to Chiropractic Care. It is very Gentle, Non-Invasive, Non-Force technique that is based on results for healing people from the inside out. KST utilizes a tool called an ArthroStim™. There is no cracking or popping sound during adjustments. This technique was first developed in 2003 by Dr. Tedd Koren and is now being offered at Caron Chiropractic Clinic in St. Paul, MN. There are three Steps known as the 3 Cs of Koren Specific Technique. These steps are called Challenge, Check and Correct. Step 1: Challenge – this first step analyzes the patient’s entire structure to find where the problems exist. Step 2: Check – this second step looks for proper positioning. Your chiropractor will use the base of your skull as a yes/no system for determining which areas need adjusting. It is similar to applied kinesiology. Step 3: Correct – this third step is where an experienced, KST Chiropractor will utilize an ArthroStim™ for adjustments. The ArthroStim™ has been used for more than 22 years. It is a low force instrument that works at a speed of 12 taps per second. The use of this instrument allows for adjustments being made while patient is standing, sitting or lying down. Who Can Be Helped With KST? 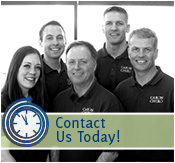 Caron Chiropractic Clinic, P.A. offers Koren Specific Technique (KST) as a gentle approach to healing. We utilize an instrument called an ArthroStim™ for Non-Invasive, Non-Force adjustments. There is no cracking, twisting or popping during a KST treatment. The technique uses three steps known as the 3 Cs. They are Challenge, Check and Correct. This gentle technique can be very effective for many different health and neurological conditions. This entry was posted	on Friday, December 5th, 2014 at 12:11 am	and is filed under Chiropractic Treatments. You can follow any responses to this entry through the RSS 2.0 feed. You can leave a response, or trackback from your own site.